This is page 2 of an article about pinball subcontractors. Click here for page 1. There were several companies that made pinball cabinets. Churchill Cabinet Company and Lenc-Smith (see the part above about playfields) are best known. As far as I know both companies delivered complete cabinets (so contrary to playfields, these did not ship from one subcontractor to another). At Pinball Expo 1995 it was possible to visit Lenc-Smith. Read here about this tour, it provides some details. With the metal plate removed to which the pcbs mount, you can see bright decals. The smallest label in this Addams Family backbox has the name 'Lenc-Smith' on it. Diner pinball machine with backbox folded down, has CCC stamped in a hidden place. 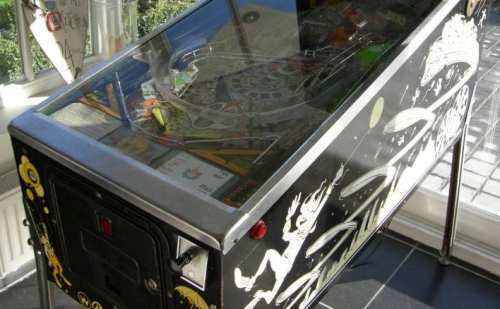 My JokerZ pinball machine has this too, and the playfield was also made by Churchill Cabinet Company. Further there are two ways to screen colors: spot and process. 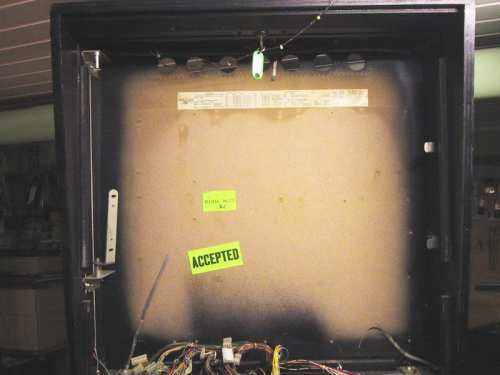 Up to the beginning of the 1980ies, every pinball cabinet was spray painted using metal stencils. The artist made a line drawing in 2 colors (+ the background color of the cabinet), of which thin metal stencils were cut. You can recognise these as they only have a few colors, have very simple designs (thin lines are not possible) and sometimes the borders are 'fuzzy', as they can have a little overspray. 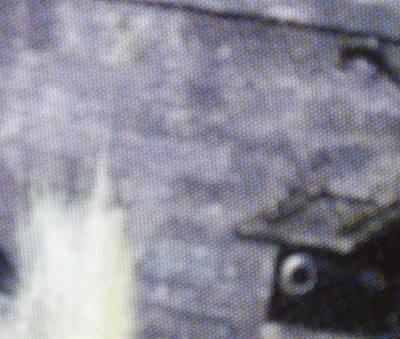 In the mid eighties, Lenc-Smith invested in a specialised machine that could screenprint onto large panels of wood. These panels were then later cut into pieces and assembled. 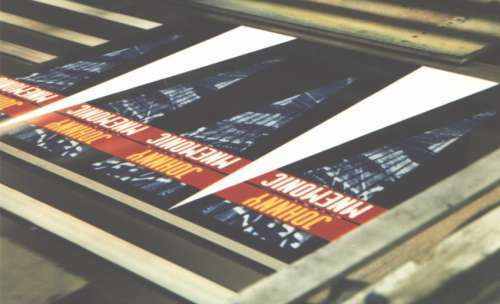 The panels however had to be covered with a very thin white vinyl before printing. About every Williams game made in the nineties is done like this, as WMS Industries owned Lenc-Smith. The quality of the artwork is very good, however where the legs attach to the cabinet, small wrinkles appear. Because of this some people confuse them with decals. They are no decals ! While the result is similar, the procedure is totally different. Decals are printed and then applied on the cabinet. This is a vinyl primer coat on the wood to make it smooth. Pinball backbox side panels for Johnny Mnemonic screened on white vinyl covered wood. Ready to be cut. The LS vinyl cabinets do have a big problem with fading. Especially red and yellow colors can fade until they're almost completely gone, showing the white base vinyl layer. On some machines Lenc-Smith did not use the vinyl layer but the cabinets were first covered with white paint. I suspect this technique was used on Theatre of Magic. It's confirmed cabinets for this game were made too by LS, but they 'feel' different and the yellow/gold hardly fades. Other vendors did not have this type of machine. They had to screen individual, already assembled cabinets. The artwork is screened directly onto the smooth, primed wood and it is difficult to get damaged. It also does not fade like the vinyl printed cabinets do. However this technique has its restrictions to how the artwork meets at the corners of the cabinet. This type artwork application was already used in the 1980ies. The difference with using metal stencils is that screenprinting allows for more complex artwork: fine smooth lines, even simple color gradients, .. Most games at the end of System11 (Whirlwind, Earthshaker, ..) have cabinets produced like this. 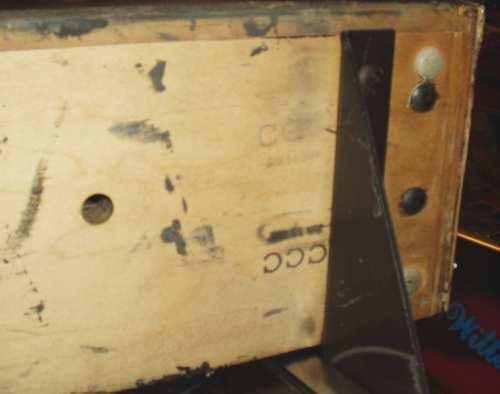 In this post to rec.games.pinball, Pat Lawlor confirms there were three cabinet suppliers being used at the time when his Funhouse pinball machine was in production. Finally screened decals were sometimes also used. Some games, like Road Show, Star Trek the Next Generation and The Shadow have a screened cabinet and decals on the backbox. It's not that there is always a difference in supplier because there is a difference in technique used. As you can read here, Lenc-Smith also supplied these decalled backboxes. One reason for this was to cut costs, another was to allow cabinets / backboxes to be made by multiple companies, as not everyone had the same capabilities or sometimes demand was too high for one company to fulfill all orders. You can see the color difference in the blue between the decal and border on the backbox. Depending on how popular a game was, and how busy the cabinet factory was, it's possible that one run of a game used different suppliers for the cabinets. So it's possible to find some machines of one model that have a screened cabinet and other machines with decals or vinyl base. Multiple suppliers providing cabinets for one game also put limits on the artwork. The cabinet artwork for Fish Tales for example had to be reduced from 6 to 4 colors to allow production by different suppliers. There were also experiments. Funhouse sample games for example were made with a cabinet painted blue and a (cut out) decal, while the normal run was screened. Prototypes are often different (both in artwork and way of applying it to the cabinet). 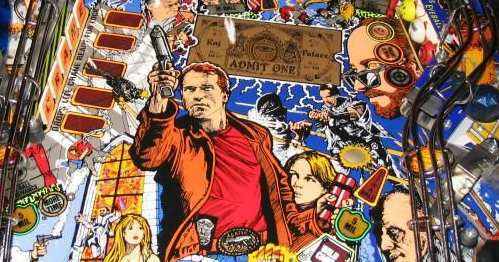 Almost every Williams / Bally cabinet and playfield artwork until then was made using 'spot colors'. This means that the color you see is the actual solid, opaque color of paint used. There are however gradients possible, orange can be made up using a yellow base color and a red gradient pattern on top of it. If you look closely you will see the yellow base and red dots. A separate screen must be made for each different color used. On electro-mechanical games most playfields used 7 or 8 screens but later they used a lot more, Fathom and Addams Family used 11.  Process half-toning is a different way of screenprinting. On a white base layer only 4 colors are screened: cyan, magenta, yellow and black (key). This is similar to how an inkjet printer works (CMYK). The colors overlap each other, they are not solid, and their combination will make up different colors. The advantage is that it's cost-effective (only 4 colors to screen) and almost any color can be produced and used. Beautiful almost photo-realistic results can be achieved, instead of hand-drawn, cartoony-looking artwork. Disadvantage is that as small dots of each color are printed close to each other, it looks very dithered when you look very close at it (similar to looking close at a picture in a newspaper). certain colors like grey (for which all 4 colors are necessary) cause a lot of dithering. Colors that are only made up out of two of the CMYB colors look more solid. 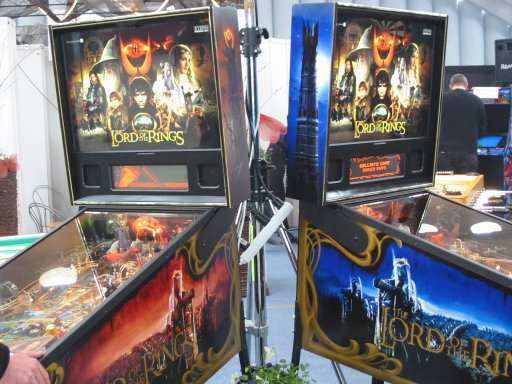 Process screening: see how realistic faces look on this Stern Lord of the Rings pinball playfield ? All the different colors flow into eachother. Spot colors: while the colors are solid, black lines separate them and designs are simple. Can you imagine how LOTR would look when it was screened this way ? Williams also used process colors for the cabinets in the 1990ies. Medieval Madness for example was a 4 color process with 2 colors (black and blue) printed as spot (solid). This printing process explains the way some cabinets fade: red is made out of a yellow and magenta. Magenta will fade first, once it's gone instead of red it will show the yellow base color. The magenta in the red letters on the cabinet faded showing the yellow base color, while the green did not fade as much. As far as I know Williams never used process colors on their playfields, only for cabinet artwork. Sega however did use process for their playfield, sometimes in combination with solid spot colors. Starship Troopers as an example used solid screened spot colors for the bright 'bug' colors (yellow, green, red, blue) while the rest of the artwork was process printed. Churchill Cabinet Company now still makes cabinets and playfields for Stern Pinball. Stern also uses a 4-color process for their cabinets and playfields. Some people complain about the dithering on the cabinet artwork caused by this process. Dithering is however nothing new, as Williams cabinets also used gradients and were using a 4-color process on which you can also see the small dots when you look closely. The difference is that because Stern uses more photo-realistic artwork, dithering can be quite explicit (using all 4 colors) and depends on the source used. Williams used more hand-drawn artwork with solid colors and gradients, dithering was more subtle (only 2 colors) and kept under control by the artist as he made the whole drawing himself. Dithering on Stern Pirates of the Caribbean cabinet. Dithering on Bally Cirqus Voltaire backbox. 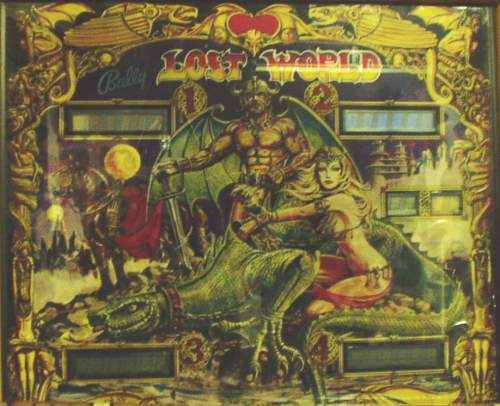 Lenc-Smith was a WMS subsidiary, however it was still considered as a separate company from the pinball manufacturing company. At the end of the 1990ies there were strikes at LS, so other companies had to make the cabinets for Williams then. This is even reported in the SEC filing by WMS (look at the 'Employees' part near the end of the document). More information about the strike can be found in this article and this article. 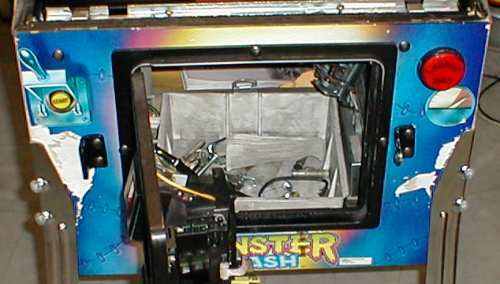 This strike explains why most Monster Bash, Cactus Canyon and Revenge From Mars pinball machines have cabinet decals (that easily get damaged and wrinkle around the legs), contrary to cabinets on previous games. But of each game some were made with screened cabinets. Monster Bash with a lot of damage to the cabinet decals. Only for the production run of the Pinball 2000 game Star Wars: Episode 1 the strikes at Lenc-Smith were over, so all dedicated games again had a good quality screened cabinet (and decals were also created for use with the conversion kits). Mr Gillard of The Pinball Factory has supplied me with historic production information from Williams about these games. For Monster Bash, Churchill supplied 2564 cabinets and Lenc-Smith 883 (15 of these were for prototypes). As you can read on this site about Monster Bash, the prototype cabinets were screened with different artwork. For Cactus Canyon, Lenc-Smith made almost all the run: 859 (16 prototypes) and Churchill only supplied 99 cabinets. Churchill had the capability to produce screenprinted cabinets, so the few that exist probably were made by them and not by LS. However, not every supplied cabinet by Churchill was screened ! The games you see just don't match that theory. For Cactus Canyon about every game seems to have decals. But for Monster Bash the number of screened cabinets is also very low (probably less than 100). So probably the strike at Lenc-Smith caused that they could not screen the wood for the cabinets (like they did for all previous WPC games) but could only assemble cabinets, as that's a job non-specialised temp workers could do. To allow production to continue decals were made, which were used by both suppliers. Stern Electronics (1977 - 1985), Capcom, Alvin G., .. I don't have any information who made their playfields and cabinets. If anyone knows something about this, please let me know..
Backglasses were used on pinball machines since the beginning of pinball. It's a piece of glass with the art screened on it. Some even use mirroring for extra effects. These start as complete mirrors of which the mirroring is etched away to make room for the colors. Advertising Posters was the company that started making backglasses for many pinball machines. Bally was first (lead by Paul Faris) to be able to screenprint backglasses in a 4-color process. This resulted in more realistic backglasses. This was first used on Lost World in 1978. At the end of the 1980ies pinball companies switched to translites. Gottlieb started using photo-realistic translights, while other companies stayed with drawn artwork. Translites have the advantage that they are cheaper to produce and are better for an operator as it's more difficult to get damaged (a broken backglass must be replaced, now operators can just use a new clear glass and put the translight behind it. Serigraph created the translites for Williams pinball machines. They offset lithography printed in 4 colors on the backside of clear polycarbonate film. Translucent whites and opaque silver for non-backlit areas is added. Polycarbonate film was used due the its stability, when exposed to the heat generated from the bulbs. Sun Process also made a lot of backglasses for Williams. As they were a screenprinter and translites were offset printed, SP didn't produce these themselves but used a subcontractor to provide Williams with translites. It seems WMS switched all the time between the Serigraph and Sun Process for translites. Not every WPC game uses a translite. If the designer really wanted they could have a real backglass. No Good Gofers for instance has a real glass backglass. It was Pat Lawlors decision, as he wanted a cartoony traditional look to the game, and feels that the older backglasses make better, brighter use of light. The NGG backglass was made by TAG. 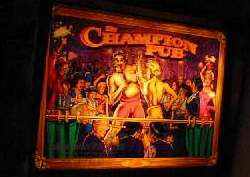 The Champion Pub, made a year later by Williams also had a backglass but this was produced by a company named 'Gfx Inc'. Thanks to Duncan Brown, Robert Fesjian, Ron Baum, Wayne Gillard (The Pinball Factory), Larry Kramer (Serigraph), Pat Lawlor (Pat Lawlor Design) for providing information for this article. Thanks to Dave of BillySeven.net for the pictures of the Lenc-Smith Expo tour 1995. Thanks to everyone on rec.games.pinball who posted a bit of information about this subject.